This ultraviolet stabilized Ballistic Nylon cover acts as a barrier for the tube from the sun, and is tough enough to resist abrasion and puncture. All seams are double stitched and stress points are box stitched with extra backing panels for the best support. Extra-wide webbing straps with corrosion-proof buckles and snaps are ready for years in the sun. Heavy duty YKK zippers resist jamming and can be rinsed clean. Available in bright yellow and red for excellent visibility. 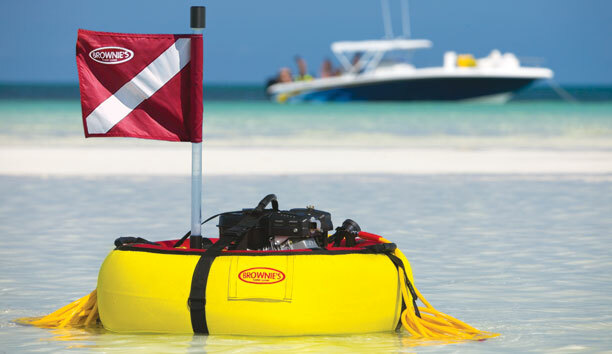 Secure molded carry handles for launching from boat or beach. Easy inflation - Integrated check valve, so air won't seep out unexpectedly. Inflate tube straight from compressor unit, no extra tools necessary. Easy deflation - lock open feature, can be totally deflated in less than 30 seconds. 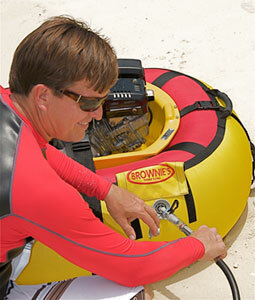 Contact Us to order an inflator.